This book takes us to the town of Peterborough, Ontario for one week in October, where there are many characters to read about, all with their own stories and struggles,but Hugh is at the center of them all. Hugh Argylle is the owner of the town’s art gallery. We follow him through his days as he handles his own life, while simultaneously showing concern and interest in the lives of his friends and their children. His mother is dying. His gallery is on the line, financially. He is planning a 30 year anniversary dinner for his foster sister and her husband whose marriage seems to be falling apart. His foster brother (and best friend) is taking on the burdensome Burton (“It’s hard not to think that Burton ought to be killed.”) and possibly entering into an inappropriate relationship with a student. Hugh’s long time ex might be losing her marbles after being left by her husband. The children are on the cusp of adulthood and trying to figure out their lives. And, on top of everything else, Hugh finds himself falling in love at the age of 50. Life can be messy and painful, but even more so if you’ve just fallen off a ladder and have all this to deal with while trying to pretend that you’re not walking around with a splitting headache. (After falling off his ladder) Wind bellowed out of him, he lies there, unable to gasp for the longest time. It becomes clear, in a sunburst of cheap pop epiphany, that he has been this way his whole life: unable to breathe, lying as still as possible to avoid pain. 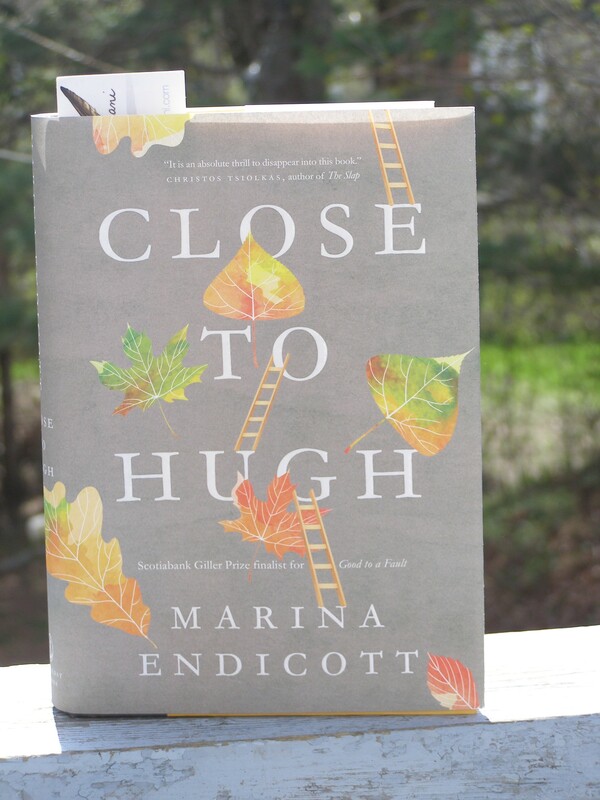 Close To Hugh is not a book to pick up lightly. Be ready to pay attention. There is a lot going on, and the writing style is not smooth and easy to read. Instead, it feels choppy, almost like stage directions for a play. Which makes sense in this case, since a big storyline in the book is about the drama class at the High School. The whole book feels like it could be a play, with quick scenes, clipped sentences, and a lot of dialogue. There is a lot in the book about theater, and lines from plays are often quoted by the characters. If you are into theater, then you might really enjoy this, but, for me, it was my least favourite part of the book. I was more drawn to the lives of the characters, their moral dilemmas, and the interactions between the generations. Endicott is very adept at the interplay between the aged and the young. It seems everyone is watching each other, silently taking note, and trying to make sense of what they see. (18-year-old Elle) Because don’t be fooled, there is no good in the world. In this whole life, you will only lose everything you love, one thing at a time, and no matter what good things might happen it will never be enough to make up for death. There are a lot of puns in this book – some people will enjoy them (I did not mind them), but some might feel irritated or distracted by them. “Hugh lives his life in the second person, never quite sure whether it’s Hugh or you.” There are also sections in the book, narrated by Della, that sometimes feel a bit cryptic because of the way they are written. Once again, I didn’t mind them. I thought it was an interesting way to capture her fragmented thoughts about her life. It helped me get a sense of how anxious she must be feeling about her missing husband and her growing daughter. Overall, I think Endicott’s new book shows confidence in her ability to write in a style that might not appeal to everyone, but that does justice to her story. It took me a while to get through this book, and there were a few times I felt impatient with the length of it (mostly during the drama class sections), but for the most part I was happy to be spending time with Hugh; rooting for him and Ivy, admonishing him for not getting his headaches checked out, feeling for him as he spent time with his mother and his memories, and admiring him for his big heart. If you don’t mind taking the time, Hugh is worth getting to know. Ivy, What the hell was he thinking? He is incapable of anything, any relationship beyond the surly bond with Newell, the snarled strands of obligation to Della, the loose truth of Ruth. Ivy must have been drunk to nod. Even his name is hard to say: Hugh Argylle, no turning post in the middle. He called himself Hugo Argylle for a while, in university, but then it started to sound like Hugh Gargoyle. He’s pathetic! He always has been! But still, quietly, his heart is singing. Marina Endicott is also the author of Good To A Fault, which I loved. And, I have yet to read her first and third books, Open Arms and The Little Shadows, but The Little Shadows is in my TBR pile waiting for me. *Thank you to the publisher for sending me a copy of this book in exchange for an honest review. Ah puns! I think I’ll be staying away from this one. I get enough puns from my husband! I loved Good to a Fault, and will give this one a try. You make it sound good (though I am now leery about the puns. I hope it’s not as bad as the onslaught of similes in The Girl Who Was Saturday Night.) Thanks for sharing Naomi! I wouldn’t be able to say how it compares to The Girl Who Was Saturday Night, but I will say that the writing is well crafted. It is just whether or not it is a style you will like. I do hope you read it, so I can get your opinion on it. I can see a lot of people feeling like they’re slugging their way through it, but I quite liked it and wanted to know how everything would finish up (quietly, btw, as it should, being about ordinary life). I do hope you like it, if you decide to read it! Hugh’s epiphany about always lying still and trying to avoid pain is so sad. I’ve been wondering about whether to add this book to my list, and after reading your review I think I will (though I have a feeling I won’t like the puns). There are a few times in the book when Hugh describes himself as being miserable, yet happy at the same time, and I totally get that. And, Endicott sure gets the nuances of being human. It’s good to hear that someone might enjoy the puns! I think she had fun writing this book. Great quotes. I love the phrase: “in a sunburst of cheap pop epiphany….” I will certainly read this book. Thanks for the review. I’m glad the book appeals to you. I really think it is well written in an interesting style. There is a lot of play on words, and it was obvious to me that she was having fun with it. I hope you enjoy it! Great review! I’ve been on the fence with this one (re: whether I’d want to pick it up or not) and while I LOVE puns, I’m still not sure if this is a book for me. (I’ve been craving lighter reads lately.) Perhaps this will be a library read! I wouldn’t consider this a light read – you have to put some effort into it. The subject of it is not heavy, though. There is nothing too dark or depressing about it. If you get it from the library, you can try it and see what you think. You might even find it easier going than I did, especially if you love puns (and, if you are a faster reader than I am). You’ve piqued my curiousity about this book’s challenges and idiosyncrasies. Did you like Hugh? Aging doesn’t seem to be a theme is this book or is it? Yes! Of course there is aging! There are two main generations going on in this book – people in their 40s and 50s, and people in their late teens. The middle-aged characters don’t go on about their aging, but it is very much there. What they’ve done so far in their lives, the feeling that they might be getting too old to start fresh, etc.